Here we come to the treasure hidden deep within us. Who could have guessed that Ultimate Reality, God beyond God, would hide God’s very Self within us—AS Us! This is not the relationship of parent and child, or friends, or lovers. This is not a lofty concept of God. Rather, this is putting together the reality of form and formlessness, physical and non-physical, divinity and humanity into One gorgeous creation—us! Embracing this is the gut path to true identity and grounding that leads to creativity and courage. The goal of gut practice is for us to come to know, embrace, and “participate in the divine nature” (2 Pet. 1:4). 2. Drop your attention down to your “spiritual womb” or gut. 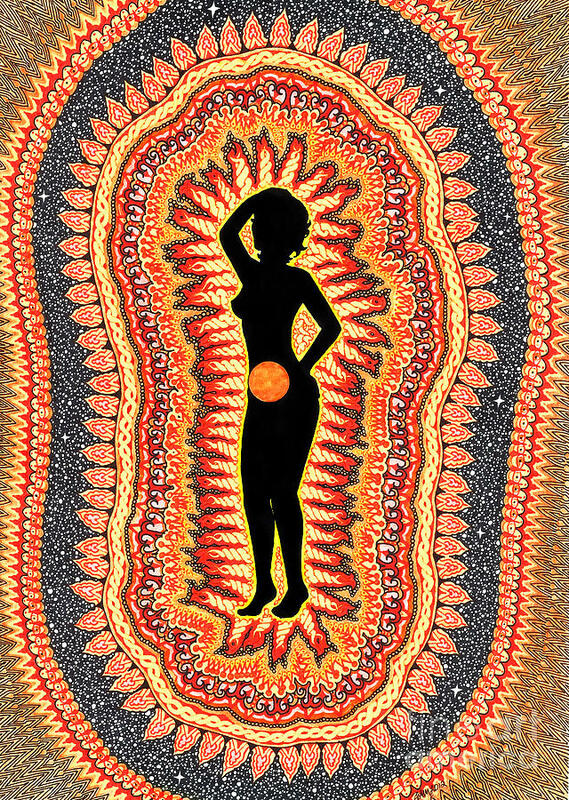 I like calling the gut our spiritual womb because of the creativity that goes on there, and using feminine imagery is good for us all! This is also called your abdomen, belly, or navel center (2-3 inches below your navel). Just like moving down into the heart (link), this is not thinking about your gut—this is being in your gut space. Notice how this center feels differently from your mind and heart centers. Studies of the human body suggest that our sensitivity to flux in electromagnetic fields largely contributes to the gut aspect of awareness which we call intuition. 3. Breathe from your abdomen. If your belly, not your chest, is moving up and down, you are doing it right. Awareness of the belly is blocked for many people in the American culture because it’s shamed. We don’t want our bellies to show. And if we do show them, we want them to be flat, hard, or toned. Some look like this. Then there’s most of us! We cut ourselves off from our abdomen and from our intuitive self, losing touch with sensing our deep, inner Divine Self. Research is helping to explain why meditators who practice breathing-centered practices report increased focus and have healthier-looking brains. 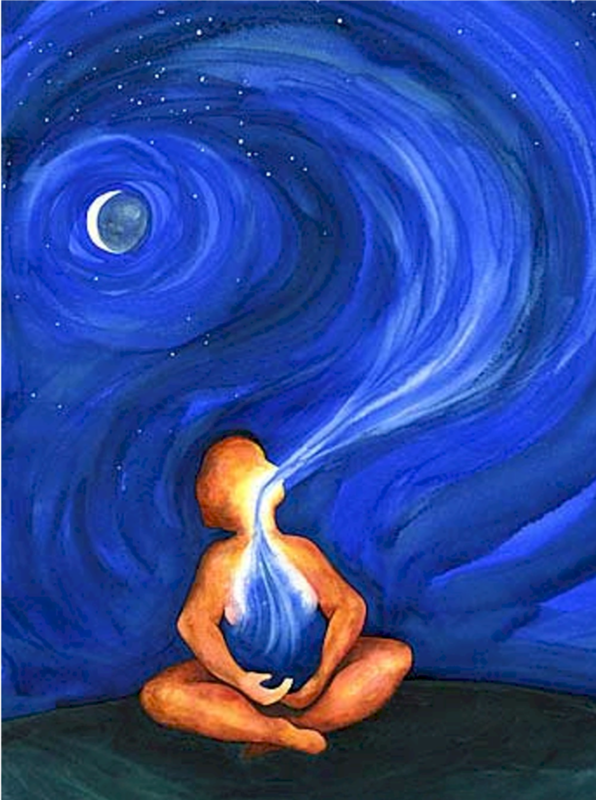 There is evidence to support the view that there is a strong connection between breath-centered practices and a steadiness of mind. Our gut, behind our belly button, produces over ninety percent of the serotonin in our body and about fifty percent of the dopamine. These two hormones are responsible for keeping us satisfied and happy, among other things. Belly-button breathing is good for us! Here’s an explanation of the image, Breathing God. Biblically, breath is a single word (rûach in Hebrew, pneuma in Greek) that also means life-force, and both God’s spirit and human spirit. Translators try to guess which one is meant by the context. Perhaps a more integral and biblical way is to assume it means all of those! The one word today that comes closest to this is “consciousness.” This means you can think of keeping your divine/human consciousness in your body by breathing in the spirit of God! If we stop breathing, our consciousness leaves our body behind and goes on to the “many rooms in my Abba’s house” that Jesus talked about (John 14:2-3). 4. Breathe earth-rooted energy up through your feet into your belly. Gut breathing is a grounding meditation, grounding in the earth, in God, in Christ. If Christ is the Christian symbol for everything—divine, human, and physical, held in Oneness—then to be grounded in Christ is to be grounded in both Creator and Creation. If possible, put yourself inside Nature for the grounding part of this practice. Even if you only have a houseplant or a view of rainy clouds outside, you have a way to connect. Or step outside and find a spot underneath some trees or walk down a peaceful trail. The point is that you want something that is naturally bound to earth to be within reach, view, or smell. Regardless of where you are, extend your awareness deeper into the ground through your feet as if you are a majestic redwood tree with strong, flexible roots. Even if you are located within a multi-story building, allow your roots to grow and travel down, penetrating every floor of the building until they reach deep into the soil and anchor you securely to the earth. Let your roots grow as deep as they can towards the center of the earth. Continue breathing up through your feet until you can feel something of that upward flow of grounding energy. Physically, grounding is the connection between the electrical frequencies of the human body with the Earth’s. Grounding yourself can help you feel calm, peaceful, centered, and energized—all at the same time! 5. Rest in the divine fire of your spiritual womb, sensing that you are made in the very likeness and image of God, loving and creating from the depths of your being. You can cultivate your intuitive self by practicing more awareness of the feelings that arise from the belly. What do you feel there when you hear good news? How about when someone yells at you? Take seriously that sinking feeling in your gut. How does your gut respond being around someone you trust, rather than someone that you’re uncomfortable with? Inadequate religious/spiritual teaching (to say it kindly) hinders our acceptance of sensing our own divinity. We have heard again and again that God is a jealous, judging, angry God and the gulf between sinful humanity and holy God is immense. But THAT’S NOT TRUE according to Jesus! God is right now BEING-YOU deep within you. You are the light of the world. We have only to remove all the wrong beliefs and self-shaming, and sink down into our deepest self, to uncover the brilliance of Divine Self-awareness. The outer world we experience reflects our inner consciousness. To see God everywhere we must first see God in and as our deepest True Self. Divine Self-awareness frees us from the limitations of the ego. When you know who you are, you see yourself not as a limited, damaged ego, but as a divine light, made in the likeness and image of God. You are no longer held back by self-doubt and fears. Instead, you feel the courage and confidence of your Divine Self shining through you, making it easier to move forward. 6. Place your dominant hand on your gut and your other hand on your heart as you let the rivers of living water flow up to your heart and out to the world. This feels like love and gutsy courage—and looks like creative action in a needy world. Never ignore a gut feeling, but never believe it is enough. If we listen to our gut intuition, pass it up through our heart, and run it past a healthy mind, we have the best guidance of all three centers. When Jesus said that rivers of living water will flow from our innermost being, he immediately clarified this by saying that he was speaking about “spirit” (John 7:37-39). “Spirit” was Jesus’ way of talking about what we today call a spiritually awakened consciousness. This began to flow in those who received Jesus’ “spirit” or awakened consciousness. (See my book Is Your God Big Enough? Close Enough? You Enough? Jesus and the Three Faces of God for a detailed, biblical explanation of this important understanding. Back then, down through the centuries, and today, those who wake up spiritually continue the divine flow of love, healing, and light to the world. 2. Drop your attention down to your gut. 3. Breath from your abdomen. 4. Ground yourself by breathing earth energy up through your feet. 5. Rest in the divine energy of your spiritual womb. 6. Place your hands on your heart and belly as you let rivers of living water flow from your Divine Self out to the world.